The long spell of bitterness between Libya and the United States seems to be related to a territorial dispute going back to the 1970’s. Shortly after Gaddafi came to power in 1969, he declared that the Gulf of Sidra belonged to Libya, and that anyone crossing beyond what he termed, “The Line of Death”, without permission, would invite a military response. That seemed to be a reasonable position to me; after all, there is a certain line that you don’t cross on my property without a problem. But to the leaders of the United States, at the time, it presented a challenge, a sort of double-dog-dare. The U.S. would eventually cross that line for no other reason than to see what Gaddafi would do. This fatal flaw in past American foreign policy has led to a countless loss of human life and property. So just where is the Gulf of Sidra? 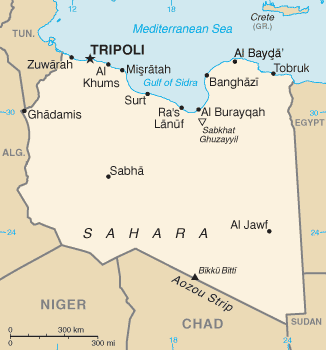 It’s right smack between Benghazi and Misrata in Northern Libya (see Map below). Does this look like a part of Libyan territory to you? It sure looks like it to me. It’s definitely not United States territory. How many lives have been lost due to the United States insistence on policing Libya, and the rest of the planet for that matter, over trivial matters like this? I would bet that I’m not the only one that could have given a flip about the Gulf of Sidra, then as now. Yet, if Libya were to send a fleet of armed vessels into the Gulf of Mexico, just off of our Southern coastline, I would venture to say, “there would be hell to pay”. Perhaps it’s time we put ourselves in Gaddafi’s shoes for a moment. The Gulf of Sidra is a body of water in the Mediterranean Sea on the northern coast of Libya; it is also known as Gulf of Sirte. The Gulf of Sidra has been a major centre for tuna fishing in the Mediterranean for centuries. It gives its name to the city of Sirte situated on its western side. The gulf measures 273 miles (439 km) from east to west, and occupies an area of 22,000 square miles. After the coup d’etat which brought Muammar Gaddafi to power in 1969, there have been a number of international incidents concerning territorial claims of the Gaddafi regime over the waters of the Gulf of Sidra. 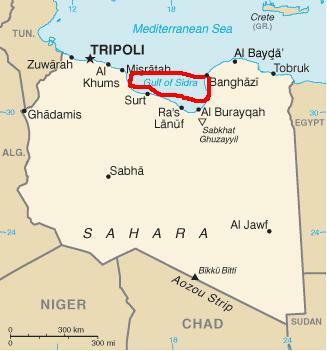 In 1973, Gaddafi claimed much of the Gulf of Sidra to be within Libyan territorial waters by drawing a straight line at 32 degrees, 30 minutes north between a point near Benghazi and the western headland of the gulf at Misrata with an exclusive 62 nautical miles (115 km) fishing zone. Gaddafi declared it The Line of Death, the crossing of which would invite a military response. The United States [in accepting the invitation] claimed its rights to conduct naval operations on international waters, a standard of 12-mile (19 km) territorial limit from a country’s shore. Gaddafi claimed it to be a territorial sea, not just a coastal area. In response the United States authorized naval exercises in the Gulf of Sidra to conduct Freedom of Navigation (FON) operations. On several occasions Libyan fighter planes harassed United States military planes maneuvering in the area. On March 21, 1973, Libyan fighter planes intercepted and fired on a U.S. Air Force C-130 conducting signals intelligence off the Libyan coast. During the encounter, two Libyan Mirage fighters signaled the C-130 to follow them toward Libya and land, prompting the American plane to take evasive action. The C-130 received cannon fire from the Libyan fighters as it fled but was able to escape by using cloud cover. According to U.S. officials, the American plane was never closer than 75 miles from the Libyan coast. So the U.S. provoked an incident, just to see how Gaddafi would respond, and then when he responded, we backed down. Didn’t we have better things to do in 1973, like perhaps tackling the looming energy crisis, or overcoming some great humanitarian need? Were human lives really worth the price of conducting Freedom of Navigation Operations in Libya? Freedom of Navigation is a principle of customary International Law that, apart from the exceptions provided for in international law, ships flying the flag of any state shall not suffer interference from other states. This right is now also codified as article 87(1)a of the 1982 United Nations Convention on the Law of the Sea. However, not all UN members (notably the United States of America) have ratified this convention. The United States’ Freedom of Navigation program challenges territorial claims on the world’s oceans and airspace that are considered excessive by the United States, using diplomatic protests and/or by interference. The United States position is an insistence that all nations must obey the international law of the sea as stated by the UN Law of the Sea Convention, though the United States has yet to ratify the treaty. Some coastal states make claims that the United States sees as inconsistent with international law, which, if unchallenged, would limit navigational freedoms of the vessels and aircraft of the U.S. and other countries. On several occasions, U.S. armed forces have conducted operations in areas claimed by other countries, such as naval operations in the Gulf of Sidra in the 1980s. Throughout the years U.S. forces have been performing “Freedom of Navigation” operations in the Straits of Gibraltar, Strait of Hormuz, Straits of Malacca, the Indonesian Archipelago, the Black Sea, and occasionally the Canadian Arctic. So let me get this straight, while I was in junior high and high school, the U.S. government was busy establishing a policy to unilaterally enforce UN laws which the Congress has yet to ratify unto this day. This all looks pretty foolish in retrospect; although I’m sure it was serious business at the time, at least for anyone who actually cared. Apparently for those who did care it was worth putting countless lives in harm’s way. One has to wonder if anyone was really hurt by being prohibited from entering the Gulf of Sidra in the first place. If so, who? In August 1981, during the United States Sixth Fleet FON exercises, Libyan fighter planes were assembled from elsewhere in the country to fly patrols near the American ships. On August 19 two Libyan Su-22 Fitter fighter-bombers were intercepted by two F-14 Tomcat fighters from the aircraft carrier Nimitz. During the engagement, one of the American planes was targeted by an air-to-air Atoll missile. After evading the missile, both Libyan planes were shot down with Sidewinder missiles launched by the Tomcats. According to some reports, the two Libyan pilots managed to eject and were rescued from the sea. According to other reports, one of the Libyan pilot’s parachutes failed to open. So after a near miss in the 70s, the U.S. decided to send in more ships for another Freedom of Navigation exercise. It would appear that we had no other reason to be in the Gulf of Sidra other than to provoke some kind of response from Libya. When the response came, a Libyan soldier had to die. But even that wasn’t enough. Somebody needed to be taught the lesson of, “do as I say, or else”. In the spring of 1986, the U.S. Navy deployed three aircraft carrier task force groups, USS America, USS Coral Sea and USS Saratoga from the Sixth Fleet with 225 aircraft and some 30 warships across the “Line of Death” and into the disputed Gulf of Sidra. After a day of armed conflict, the operation was terminated after an unknown number of human and materiel losses to the Libyan side and no losses to the American side. Two weeks later on April 5, 1986, a bomb exploded in a West Berlin disco, La Belle, killing two American servicemen, a Turkish woman and wounding more than 200 others. The United States claimed to have obtained cable transcripts from Libyan agents in East Germany involved in the attack. After several days of diplomatic talks with European and Arab partners, President Ronald Reagan ordered eighteen F-111F strike aircraft of the 48th Tactical Fighter Wing, flying from RAF Lakenheath supported by four EF-111A Ravens of the 20th Tactical Fighter Wing, from RAF Upper Heyford in England to strike targets in Libya in conjunction with fifteen A-6, A-7, F/A-18 attack aircraft and EA-6B Prowler Electronic Warfare Aircraft from the aircraft carriers USS Saratoga, USS America and USS Coral Sea on station in the Gulf of Sidra. The attack lasted about ten minutes, hitting several targets at 0200 on April 15th. Two American airmen were killed when their plane was shot down over the Gulf of Sidra. Forty-five Libyan soldiers and government officials and fifteen civilians were also killed. Now there was a brilliant idea, “let’s cross Mad Dog’s Line of Death and see what happens. Then if he fights back, we’ll exact an unknown number of human and material losses upon Libyans, and then withdraw.” And later on, “if he so much as lifts a finger, we’ll take him out.” Great plan! You see, just like today, for some it matters whether the lives lost were military or civilian, but not for me. A human life is a human life. Just because one wears a uniform or a badge doesn’t make their life any less valuable. After all, don’t most soldiers have civilian wives, children, parents and siblings? Why do some then discount the loss of military personnel? That one that you killed was somebody’s son, brother, daughter, sister, father, or mother. The damage that America has inflicted on Libya has been for no good reason. By force, America challenged Libya’s rights to its own territory. The losses suffered by Libya far outweigh any damage done to Americans in retaliation. Yet, some Americans will never be satisfied, because they are unable to see beyond La Belle, and Lockerbie. I mean it’s as if Libya, for no reason whatsoever, allegedly engaged in both of these seeming terrorist acts. Yet there is another view. On the other side of the spectrum, there are those who believe that when America plays the role of an aggressive police state, and in so doing provokes, threatens or damages smaller nations, any retaliation is justified. I’m sorry, but you can’t convince me that the U.S. is without guilt in this matter. The U.S. has engaged in numerous attacks on Libya which have resulted in an unknown number of casualties. Instead of offering Gaddafi a noose, perhaps we should be offering him an apology. Bringing it up to the conflict of the day, what would the United States government do if a large group of armed protestors suddenly rose up and stormed the U.S. Capitol? Does a government have the right to defend itself? Would the U.S. government use force against some of its own citizens, or would its leaders instead step down? If the U.S. government acted in self-defense against even a handful of its own citizens, would it be right for a 3rd party to intervene by launching a type of Odyssey Dawn upon Washington, DC and U.S. military targets? Get over it. Some of us really do want to work, live and worship in peace. It’s high time that America mind its own business. It’s time to stop playing God. Let Libya resolve its own conflicts. When Libyans break Libyan laws they must pay the price, just as when Americans breach American laws. If there is a way for America to assist Libya diplomatically, then that should be our goal. However a policy of taking lives in the name of saving others is as reckless as attempting to enforce the unratified United Nations position on freedom of navigation. Shhhhh! They’re watching. Judgment day is coming. Addendum : The United States doesn’t recognize the 12 mile limit from its own shores, but believes everyone else must. Meanwhile, the U.S. claims up to 200 miles of the continental shelf as its territory. See – What Goes Around Comes Around: How UNCLOS Ratification Will Herald Europe’s Precautionary Principle as U.S. Law. In other words, unratified means unjustified. The U.S. Constitution provides the President with the power to enter into treaties with foreign nations, but holds the U.S. Senate ultimately responsible for reviewing and deciding whether the U.S. shall ratify or accede to such treaties before presenting them to the President for signature and deposit at the treaty's secretariat. Given the significant responsibility borne by the U.S. Senate Foreign Relations Committee (SFRC) in competently performing its treaty ratification and accession function, prudence and the U.S. Constitution dictate that it undertake an in-depth due diligence review of a treaty's full provisions, its relationship to other relevant treaties to which the U.S. is either a party or nonparty, and its prospective impact on related U.S. federal laws and regulations as well as the U.S. economy, before it makes a recommendation. Therefore, it is reasonable for Americans to expect that the SFRC will secure the assistance of other congressional committees possessing oversight jurisdiction and specialized subject matter knowledge to ensure that an international treaty is properly vetted and publicly reported. See: What Goes Around Comes Around: How UNCLOS Ratification Will Herald Europe's Precautionary Principle as U.S. Law.